In this week’s installment, the iTunes Guy looks at renaming files, syncing iOS devices wirelessly, matching music ripped from vinyl, and a couple of questions about tags and file names. Q: I’ve set up iTunes to sync my iPhone and iPad wirelessly. I find that if I open iTunes with my iPhone or iPad already on, it does not appear in iTunes. I then have to reboot the iPhone or iPad for it to appear. Is there a simpler solution? 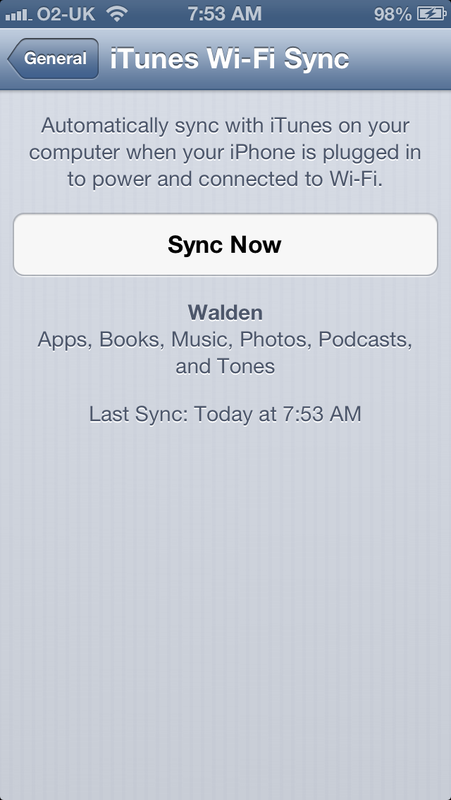 Tap Sync Now to launch a Wi-Fi sync with iTunes. I’ve found Wi-Fi syncing to be unreliable. Not only do devices occasionally disappear from iTunes, but they don’t seem to sync regularly (or, often, even when I try to force a sync from iTunes). One way to get the device to appear in iTunes is to connect it to your computer via the 30-pin or Lightning cable that came with it. But another is to launch a sync from the device. On your iOS device, go to Settings > General > iTunes Wi-Fi Sync and tap Sync Now. I find that this almost always adds the device back to iTunes again. after it’s gone missing. Q: I’m in the process of converting a bunch of vinyl LPs and 45s to add to my iTunes library. My problem is I can’t seem to get any of these tracks to match with iTunes Match, even though the tracks are in the iTunes Store. I was hoping to be able to match the music and stream to my iPhone and iPad without the pops and clicks. I don’t have any of the software that is supposed to clean that up. Do you have any suggestions on how to “force” iTunes Match to match instead of upload these tracks? I’ve heard from many people who have successfully matched tracks ripped from vinyl, so the first thing to check is the bit rate you’re using to digitize the music. iTunes Match won’t accept anything under 96 kbps. If you’re using a higher bit rate, then I don’t know what’s happening; even with pops and clicks, the music should get matched. You might want to try ensuring that the volume is sufficient when you digitize the tracks; turntables output low volumes, and if you’re not adjusting the volume, this might trip up iTunes Match. 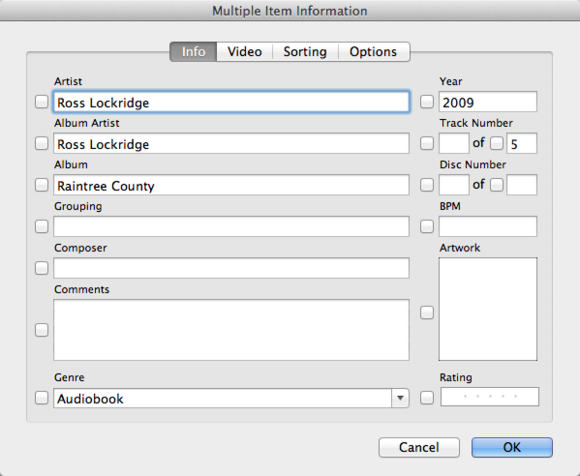 Q: I am a huge collector of audiobooks, and before iTunes 11 came out I had the importing process perfected. But now it seems to have changed. My question is not on how to join CD tracks (many tracks to one track) but how to make one book from many parts. For example I have a book that has 24 parts to it (24 separate CDs), and when I import it, iTunes doesn’t seem to collect the many parts and make them one audiobook. How can I do that? It sounds like you have a problem with the books’ tags. iTunes sees each file—each CD’s worth of audio—as a separate item, rather than as part of an “album” of audiobooks. Set the author's name and book's name for an audiobook in this window. Select all the tracks of a book, and then press Command-I. If the Info tab isn’t selected, click it. Enter the author’s name in the Artist field, then the book’s name in the Album field. You can enter the author’s name in the Album Artist field as well, but that’s not necessary. (If you don’t, check the box next to that field to clear its contents in case any of the files contain a name in that field.) Click OK, and all the files should be now stored as a single book. Q: I have a smart playlist that collects my favorite singles from various albums using their star ratings. However, over time, I find myself ignoring the other tunes I have, the ones with three stars or less, which is my default setting. Is there a clever way to collect some of those “side B” songs in a smart playlist or some other list without specifically selecting them beforehand? Not really, but here’s what you can do. Find all the songs you want and add them to a new playlist. Select all the songs, then press Command-I. In the Comments field (see the screenshot above), enter something like Side B. Next, create a new smart playlist, with the condition Comments contains Side B. This will find all the songs for which you’ve added that comment. 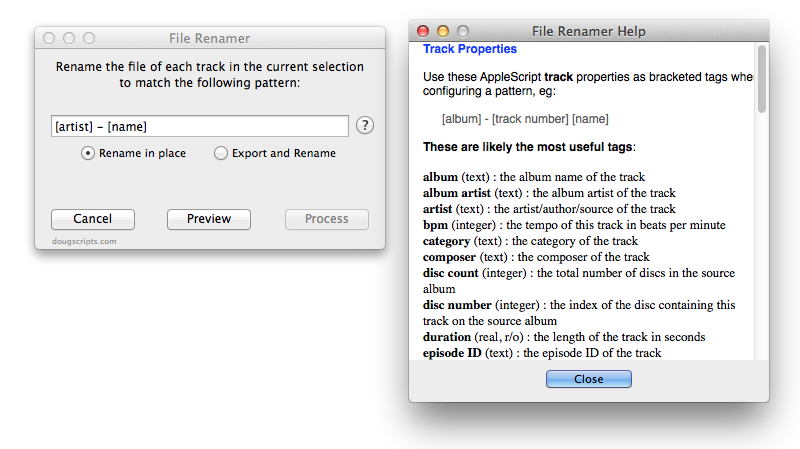 Yes, Doug Adams’ File Renamer AppleScript applet (donation requested) can name files using tags they contain. It’s highly customizable, so you can choose which tags you want to use in filenames and in which order. 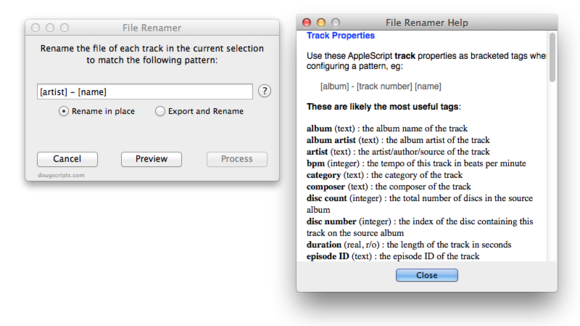 File Renamer lets you name files with any available tags. Make sure to click the ? button to see the app's help, which lists the different tags you can use to rename files.